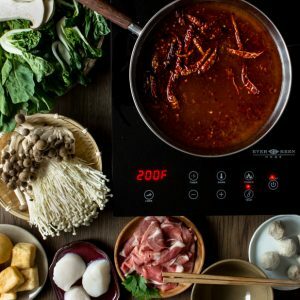 This hot pot recipe post is sponsored by Evergreen Home, a company I’m super excited to work with because I am a huge fan of using induction cooktops for hot pot. All opinion expressed, recipes and photos are my own. 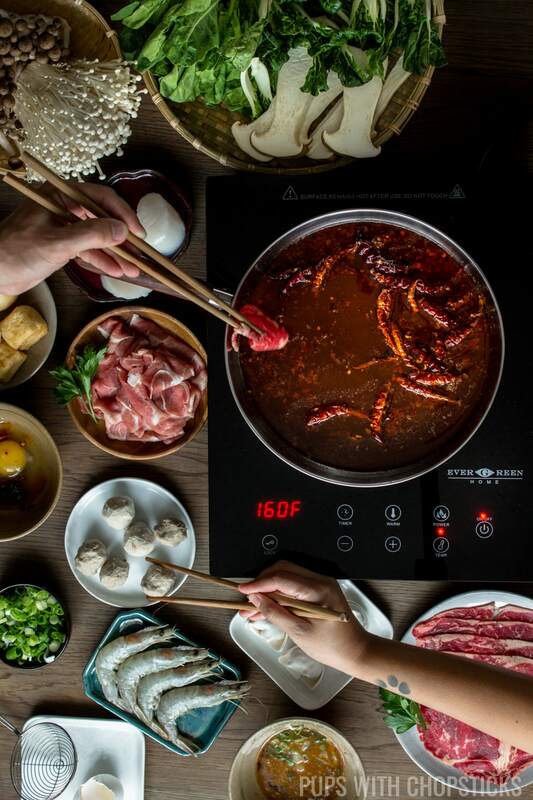 Hot pot is meant to be a communal meal which is why it is a great activity for dinner gatherings. Since the food is cooked in real time and enjoyed hot straight out of the broth in small batches, it means that it’s usually a longer meal so you can chit chat with friends and family while you are enjoying the food. 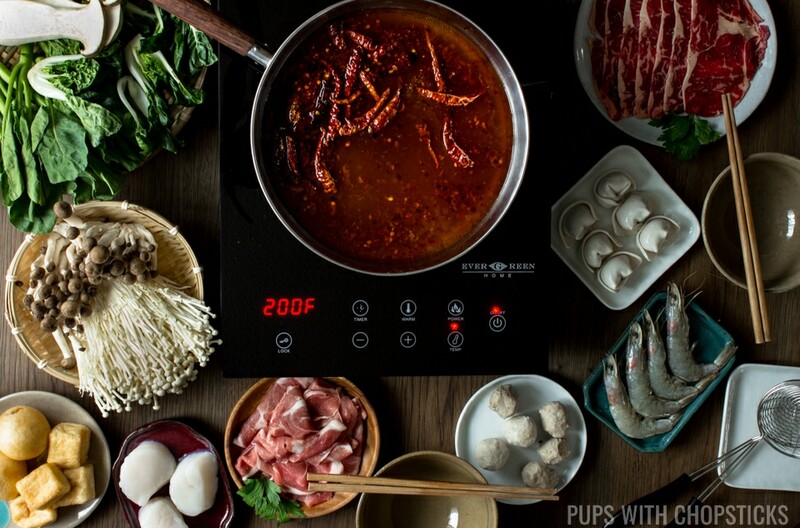 There isn’t many tools or equipment needed for hot pot, which is why it’s incredibly easy to set up for a quick dinner or get-togethers with family and friends. 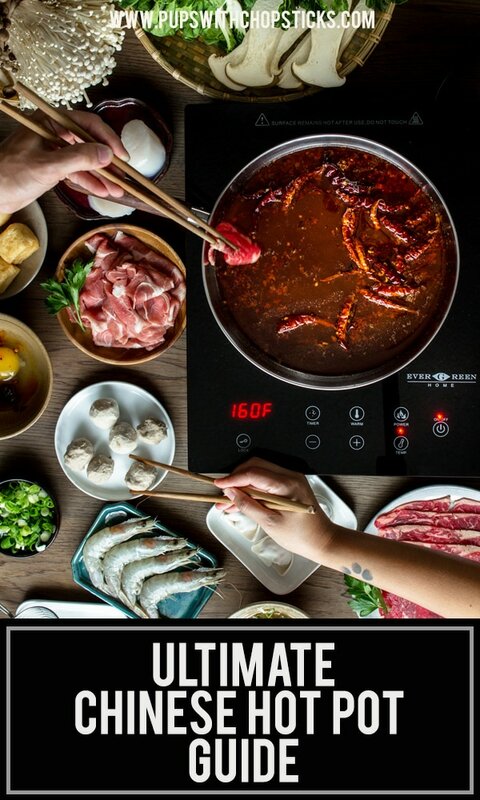 Traditionally, hot pot has always been done with a gas canister and portable gas burner but I a few years ago, I have switched from using a gas burner to using an electric portable induction cook top and I never turned back. It’s easy to use, super quick to clean up and safe. One of the reasons I switched over is because I feel a lot safer turning on a portable induction stove since all I have to do is plug it in (with an extension cord). Whenever I used a gas canister I always cringe a little inside. I never know if the gas canister has been seated in properly and I am always hoping that by hitting the button to ignite the spark to turn it on it won’t blow up on me (I’ve heard horror stories). My second reason for switching over is the easy cleanup. After a long meal and a very full belly, nobody really wants to clean up and unfortunately hot pot can get a bit messy sometimes (lot of hands and sloshing around of broth, means a lot of spills and splashes. It happens a lot!) 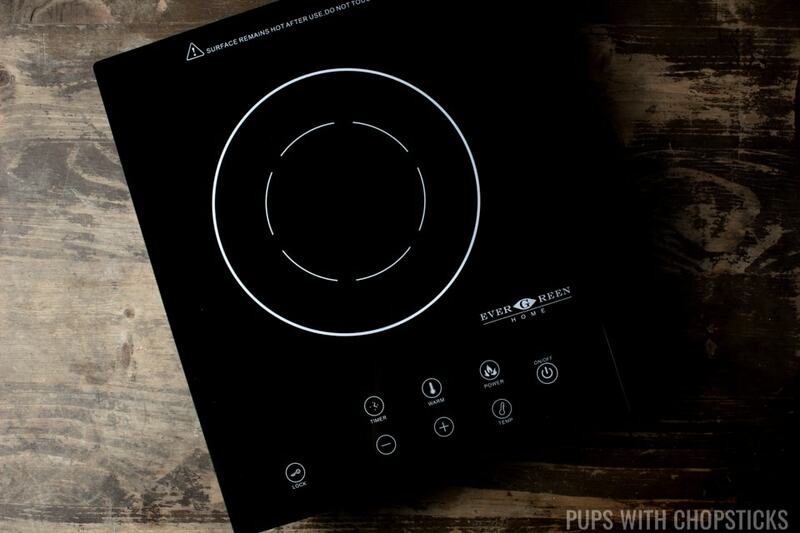 Cleanup using an induction cooktop is a breeze, just wipe the smooth surface with a damp cloth and it’s clean! No more nooks and crannies of a gas burner to clean up is always a bonus for me. A very useful utensil that is also used very commonly is a small basket like scoop. This scoop is very helpful with fishing out slippery and hard to grab foods out of the pot and into your bowl. If you can’t find these mini hot pot scoops or you don’t want to purchase it, you can use a ladle with holes or a spaghetti/noodle ladle as well. 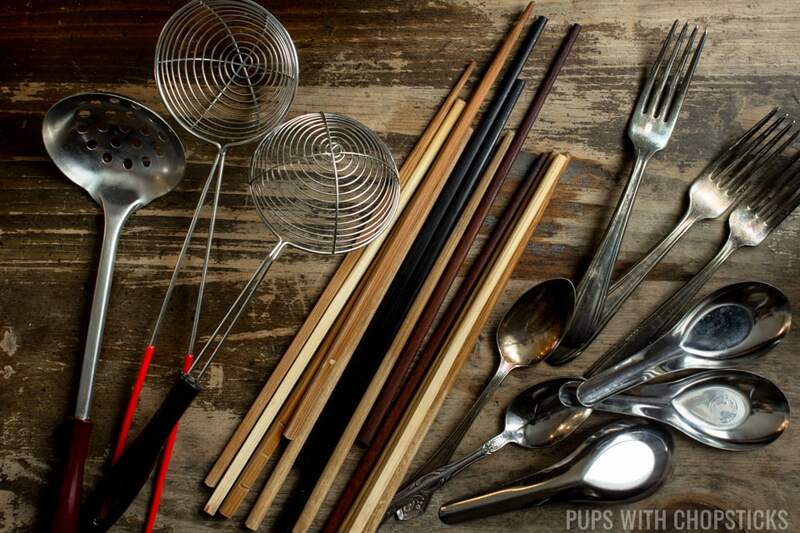 Other than the basket scoop, you can pretty much use any type of utensil you feel comfortable eating with. 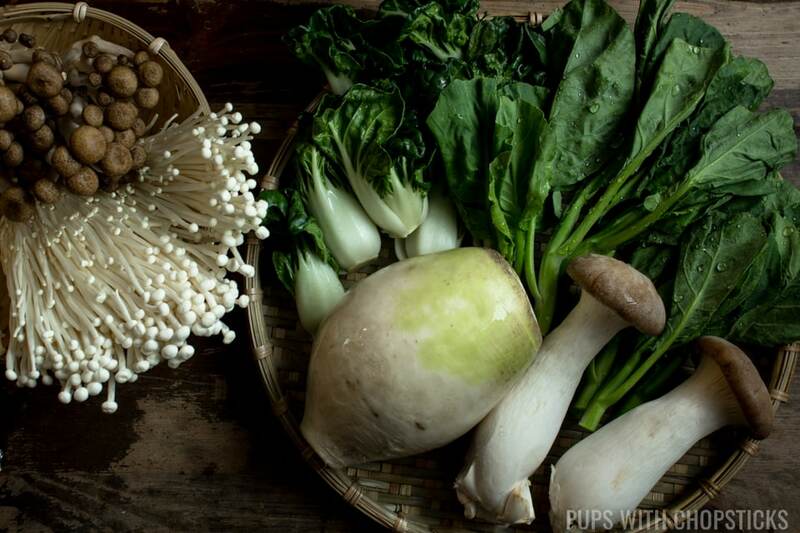 For this hot pot recipe, you should be able to find most ingredients at your local grocery store. 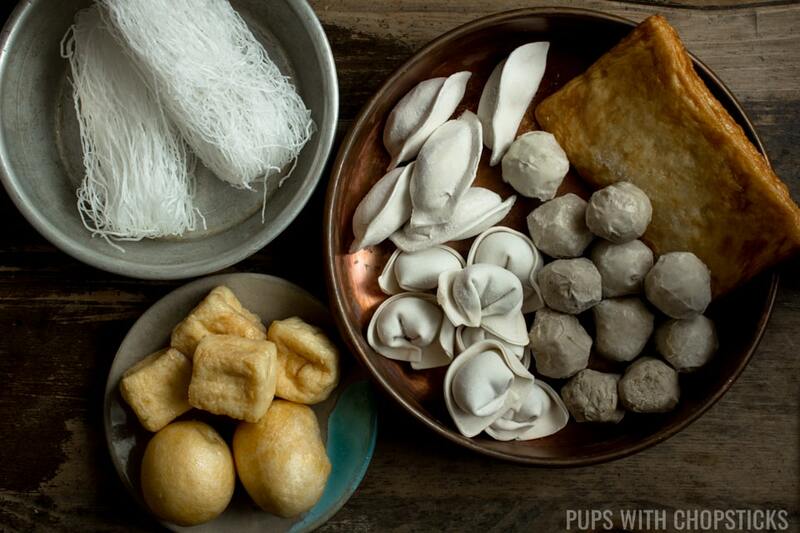 For the Asian ingredients, those can be found at your local Asian grocery stores. Although a good broth is important, since it’s the foundation of a good hot pot recipe, I personally find the dipping sauce just as important (and super fun to put together.) There’s no hard and fast rule on how your dipping sauce should taste, and you are not limited to only one type of dipping sauce – so mix and match it to make your own personal mix in your bowl! 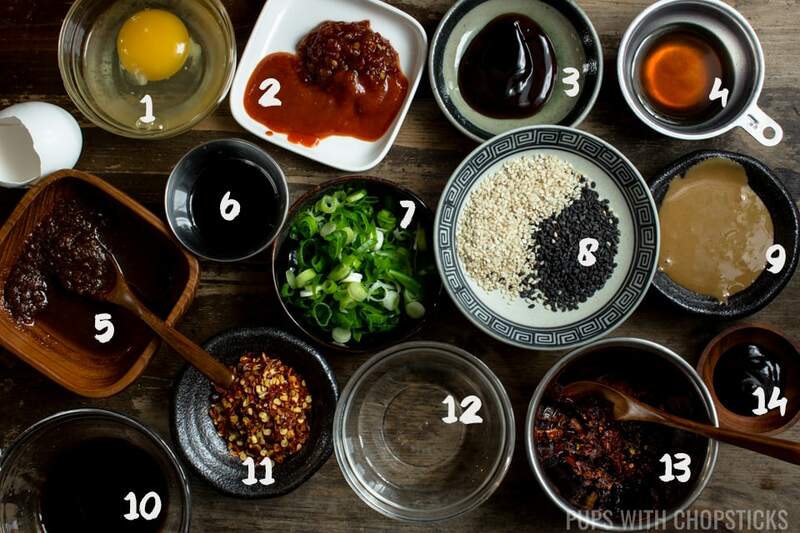 🙂 Whether you like your sauces, sweet, spicy, tangy or just savory here are a few popular options that you can use to setup your sauce stations! Although the hot pot broth is important in a hot pot recipe, I personally find I get most of my flavors from the personalized dipping sauces in our bowls. 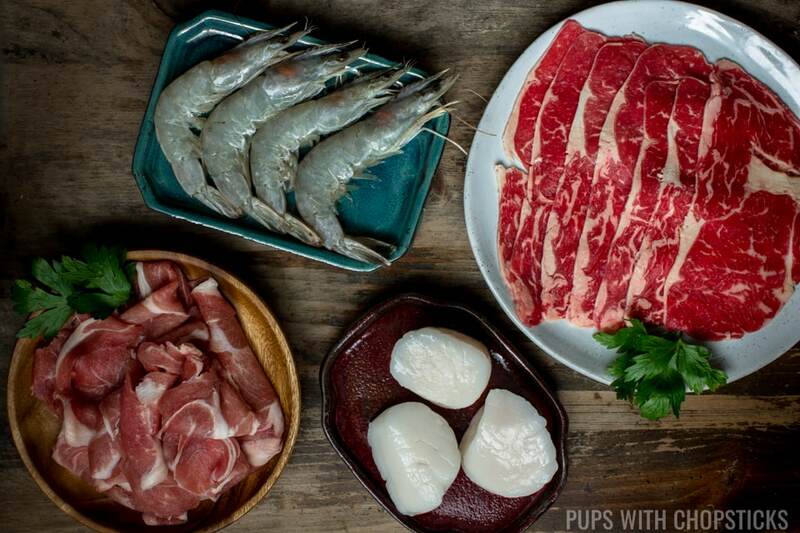 Personally, I think a hot pot recipe shouldn’t be something you are slaving over for hours so I like to keep things simple, quick and easy. That being said, I do provide an option below to give your hot pot broth a bit more depth but it will have a longer cooking time as well for those us who are okay with taking a bit more time with it. For this simple broth, just throw everything in a large pot and boil away! Once it’s been simmering for 30-45 minutes, strain everything out! For my hot pot recipe, I like to give my broths a bit more substance with a silkier broth with pork hocks (when I have time). When the connective tissues break down in the broth it gives the broth a slightly thicker and silkier consistency. Connective tissues take a while to break down so to speed up the process of this broth, you can start it off in a pressure cooker as well. If you have a butcher, ask them to cut the pork hocks into smaller 2-3 inch chunks so that it cooks faster – if you don’t have a butcher you can cook the pork hock whole, it will just take a bit longer. Whether you are using the hot pot recipe for the simple foundation broth or the silkier broth, to get it spicy you just need to pan fry dried chili flakes with a bit of oil. The oil will turn red and become mildly spicy, and you can pour the concoction into the hot pot broth when you’re ready to start. If you are feeling fancy, you can even add additional spices (star anise, cinnamon etc) into the oil while you are pan frying it. 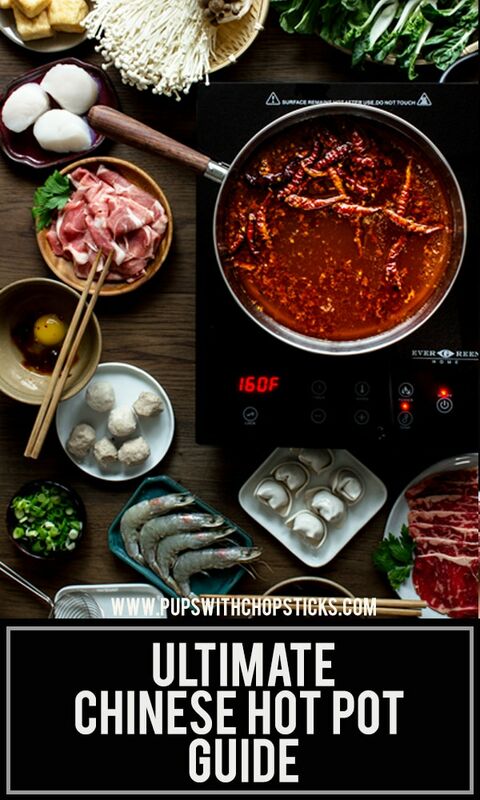 The ultimate Chinese Hot Pot recipe guide on how to make Chinese hot pot at home with ideas on hot pot ingredients, hot pot dipping sauce and a homemade broth. Boil for 1 hour with lid on medium heat. Once the broth is done, remove the spices, onions, garlic and ginger – the broth is ready to be used. Place the broth in a pot (or use the pot it’s already in) and place it over a portable induction stove and you’re good to go! Note: If the broth was reduced too much (you should have enough broth to dunk food in and to cook it), add 1 cup of water into the broth before starting hot pot. Add the pork hock into the pot once you have added all the spices in, in step 1. Skim off any floaty scum bits that floats on top of the broth. 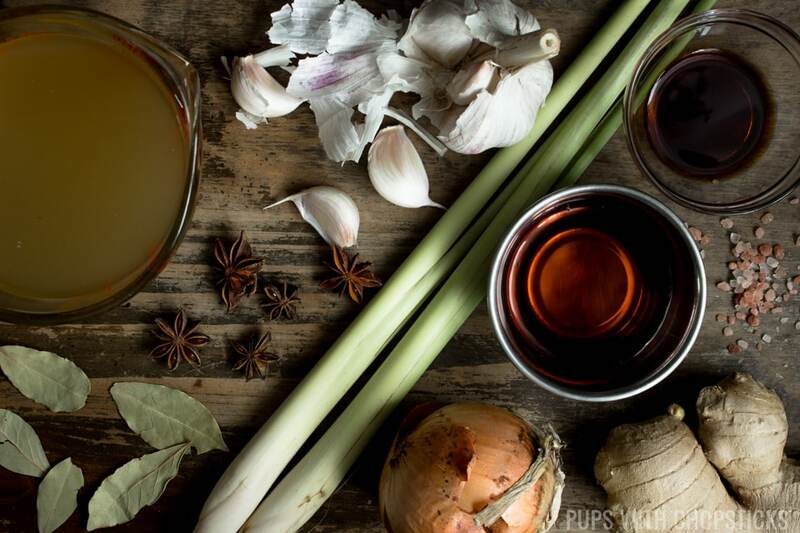 Once the broth is done, remove the spices, onions, garlic, ginger and pork hocks – the broth is ready to be used. Place the broth in a pot (or use the pot it’s already in) and place it over a portable induction stove and you’re good to go! 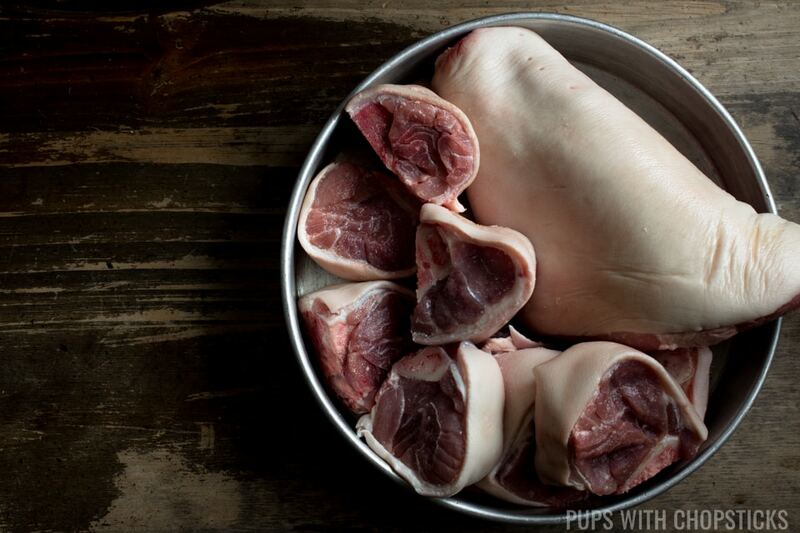 Set the pork hocks at the table and snack on them with the dipping sauces. Add the oil and dried chili flakes and toast it for 1-2 minutes. You will know it’s ready when you can smell it. Set the oil aside until the hot pot broth is finished. 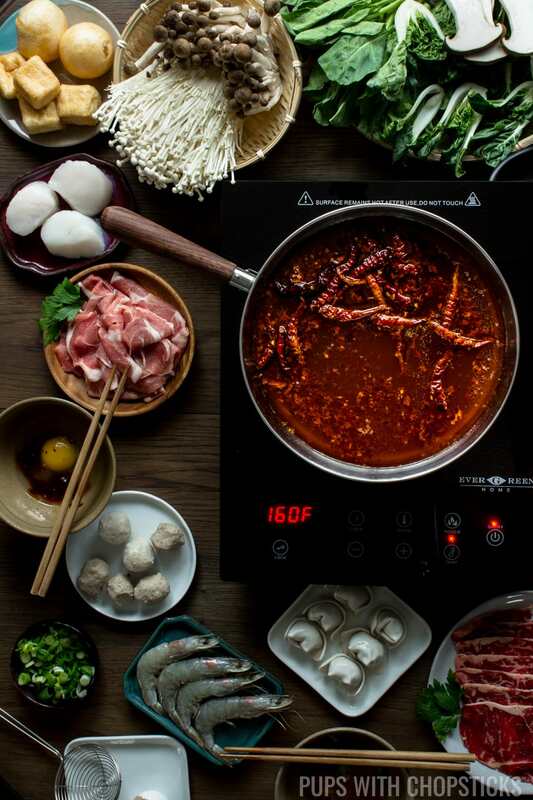 Once the broth is finished, and you are ready to eat – pour the chili oil into the hot pot broth and set the pot over a portable induction stove and you’re good to go! You can also use a pressure cooker to make the broth (with the pork hock) more quickly! 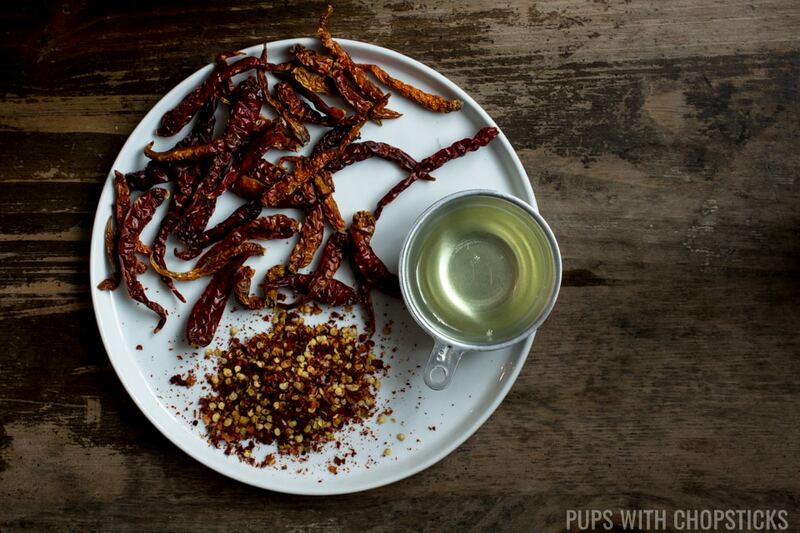 The chili oil for this recipe makes the broth ‘mildly spicy’ unless you add cayenne. If you still feel like the oil is not providing enough heat, I find it easier to add hot sauce directly into your personal dipping bowls. If you do hot pot with a large group of people, it’s a lot easier make a huge batch of broth and split it amongst 2-3 pots and burners, so that everyone can reach the pot from where they are sitting. IMPORTANT! Always keep a glass of water close by! While you are eating, the broth will evaporate a lot since it is over a constant heat. Refill it by adding water when the liquid levels are low. This Hot Pot is good to begin in this cool and cold season. I love all your ingredients, easy to get in the supermarkets. I personally can take medium level of chili hot sauce, so it’s fine .